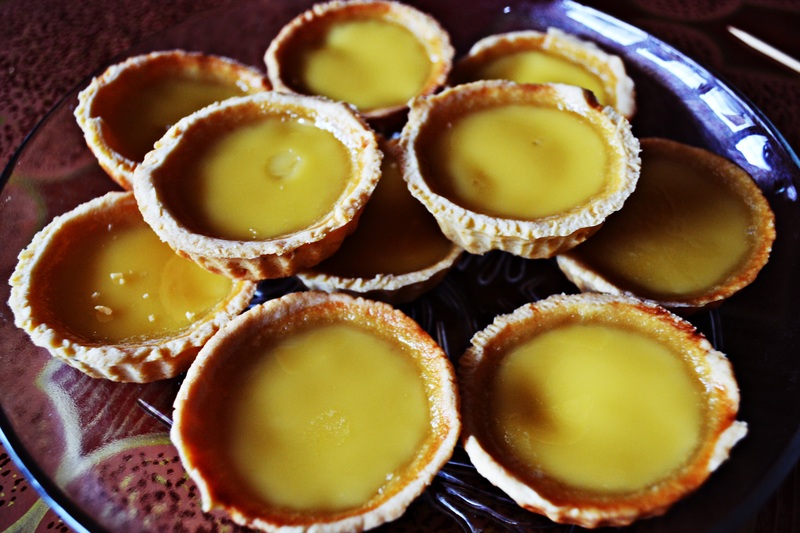 My family most favorite tart that I have to learn to make it. 1. For pate sucree: beat butter and icing sugar till wellmixed. 2. Add in white and yolk and mix. 3. Add in vanilla essence and then the flour and mix into a dough. Rest for 10 mins. Press dough into small tart moulds. 2. Whisk egg with evaporated milk. Pour in sugar water and add in the vanilla extract. Mix well. Finally, preheat the oven to 200C. Position rack in lower third of oven. 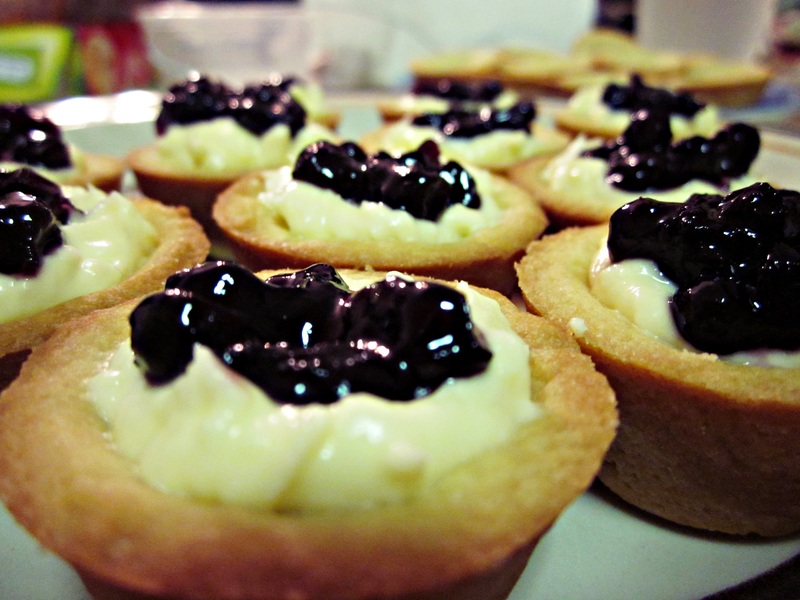 Bake tarts for 10 to 15 minutes until the edges are lightly brown. Lower the heat to 180C. Keep an eye on them. Once you see the custard being puffed up a bit, pull the oven door open about 2 to 3 inches. Bake for another 10 to 15 minutes until the custard is cooked through. Just insert a toothpick into the custard. If it stands on its own, it’s done. 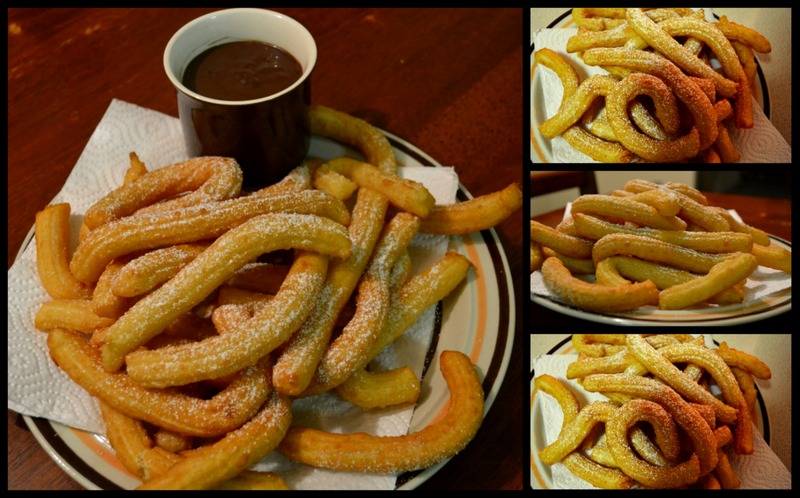 Therefore, as usual, the solution is to make your own churros in your own kitchen and eat as many as you want! Sensation!!!! 1. In a saucepan, add in the butter and water. Turn on the medium heat and stir until the butter has dissolved (~3-4 minutes). 2. Turn the heat off and add in the plain flour and a pinch of salt. Using a wooden spoon, mix it together vigorously. As it starts to really thicken up, keep mixing the dough until it pulls away from the side of the pan. Continue until the dough is coming away in one piece. 3. Cover the pan with plastic wrap and leave it for 15 minutes. 4. After 15 minutes, take the wrapping off. 5. Try to work quite quickly with the next steps: Put the first egg in and using the spoon, incorporate the egg into the dough and mix it really well. Repeat the same process with the next egg. You will get a smooth dough that you are really after. 6. 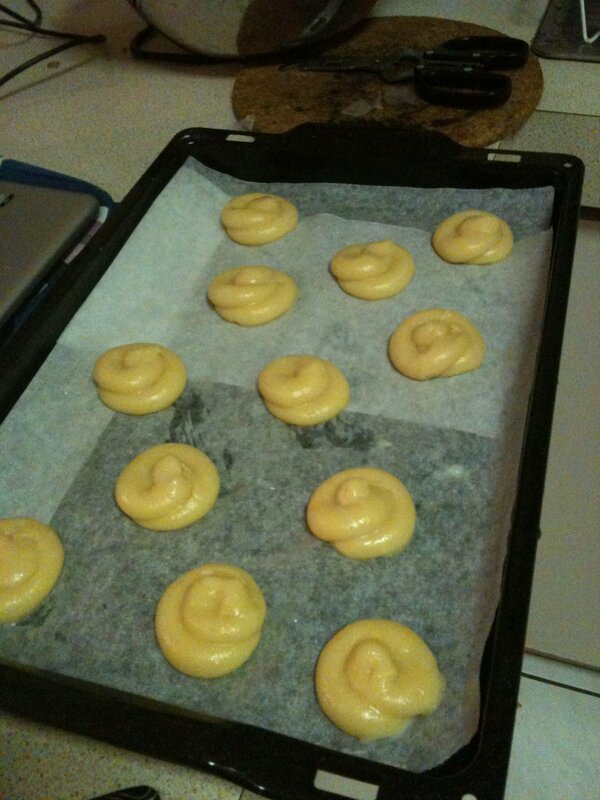 Insert the dough in a piping bag with your desired shape of nozzle. You can also roll the dough into long strips and cut them up. 7. Into a large saucepan, add in the vegetable oil. Make sure the oil is hot enough. Pipe the dough straight into the oil and cut it off (after it gets long enough) using scissor or by scrapping your finger onto the nozzle. The churros will float up to the top (takes about 2-3 minutes). Repeat the same process until finished. 8. You will get a beautiful golden brown churros. 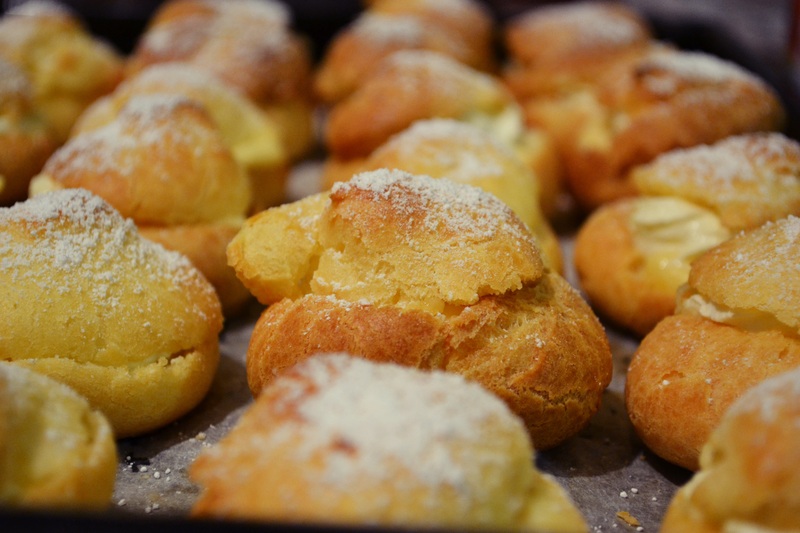 After drying them off on a paper towel, sprinkle them in some icing sugar. 1. In a saucepan on a medium heat, add in the thickened cream. 2. Add in the chocolate bar. Stir the mixture until the chocolate has dissolved. Add the chocolate as much until the colour of the sauce has beautifully turn to dark brown. You may add some sugar if you like sweeter taste of the sauce. 1. Beat butter and castor sugar till well combined. Add in egg, vanilla and salt. 2. Add in flour and mix till a soft dough is formed. 3. Keep in the regfrigerator for about 30 minutes. 4. 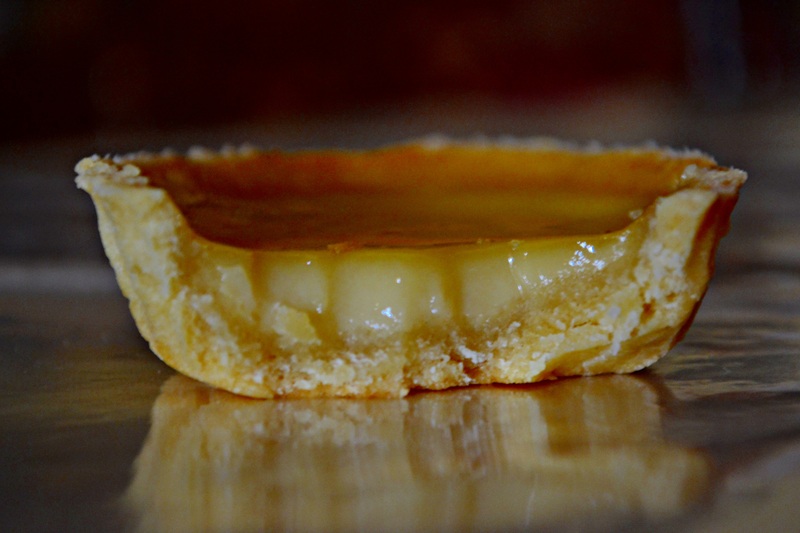 Press into the tart shells moulds and prick some holes onto the pastry. 1. Cream the above ingredients. Place in the piping bag. 2. Pipe the filling onto the tart shells. 3. 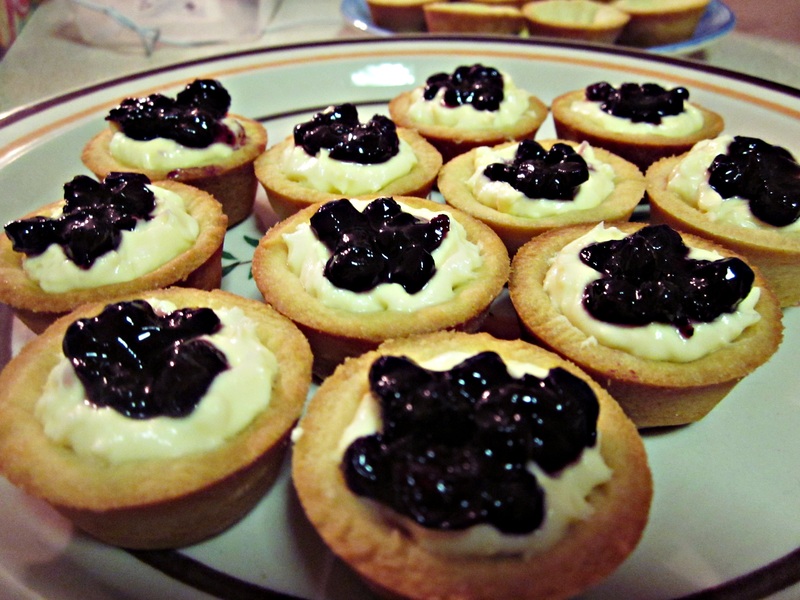 Place a bit of blueberry pie filling on top and using a toothpick, make a pattern on top. 4. Return to the oven and bake for another 10 minutes, using the bottom heat only. That was one time when everybody put colourful macarons photos in their facebook that they have just eaten. I was attracted to their shape and expensiveness that I decided to try to make it myself. I waited until the autumn break before spending my whole day working on it. My first trial was an epic fail. I used a totally wrong method of mixing the egg whites so I ended up having a ‘cotton-candy like biscuit’ rather than a perfectly crunchy on the outside and chewy on the inside macarons. 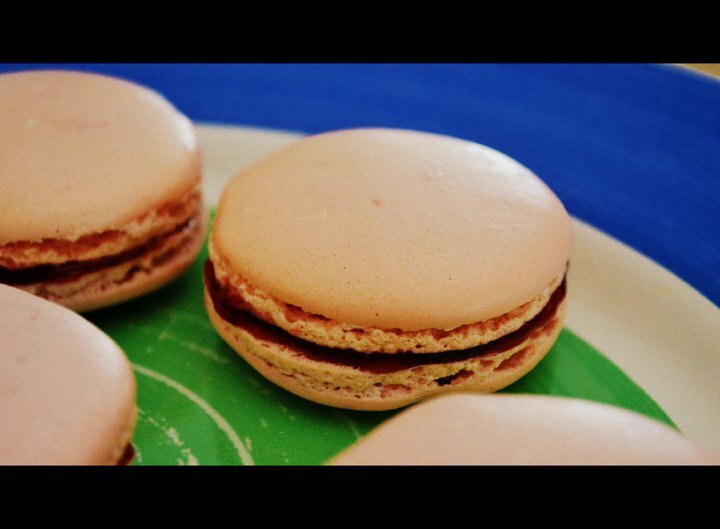 Basically, the basic macaron recipe is relatively easy. 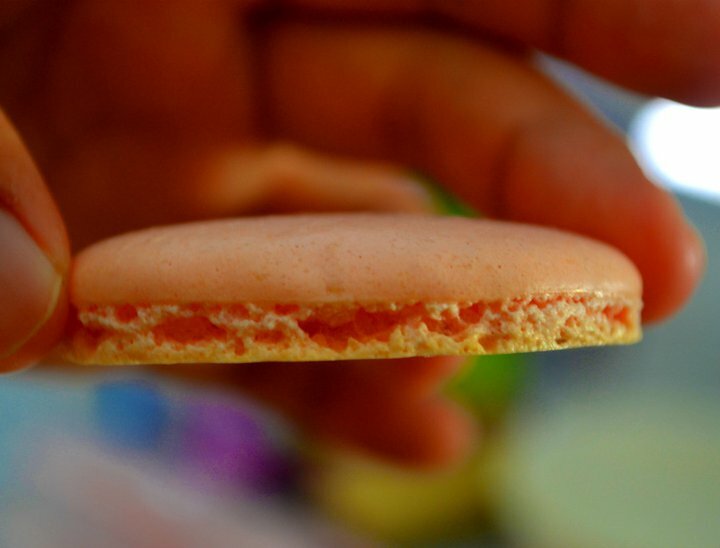 However, there are few steps u need to consider to make perfect macarons. Mine is not perfect yet. 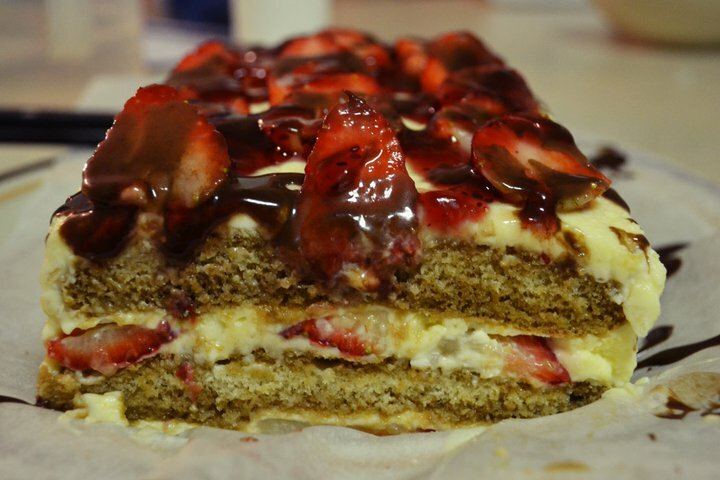 The recipe is from fr Chef Keiko. 1. Whisk the egg whites in a large clean bowl with your electric mixer. When foamy, add 1/3 of the granulated sugar and continue whisking for a few minutes. Add another 1/3 of the sugar and whisk until the egg white is stiff. This takes a few minutes, so be patient. Add the remaining sugar and keep whisking until you have a perfectly firm and shiny meringue. 2. Next, sift the almond powder and icing sugar and gently fold half of it into the meringue. A rubber spatula is the right tool for this. 3. Add the remaining almond powder and icing sugar and fold them into the meringue, as well. Then, mix more rapidly until the batter is smooth and shiny. 4. I just wanted to stress that the consistency is really important. 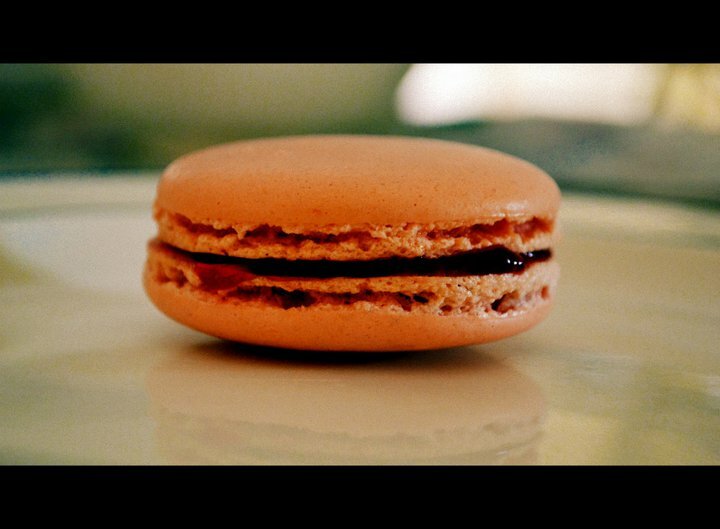 There’s not much you can do wrong with macarons, but if you don’t get the consistency of the batter right, you will get chewy or flat, dry and crispy “cookies”. As described before, fold the dry ingredients into the meringue. Then, mix more rapidly. 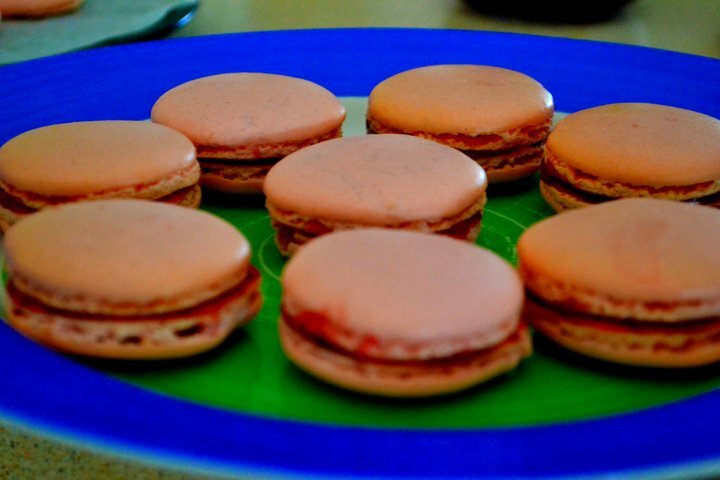 If you beat too much, the batter will be too runny and the result will be chewy macarons. 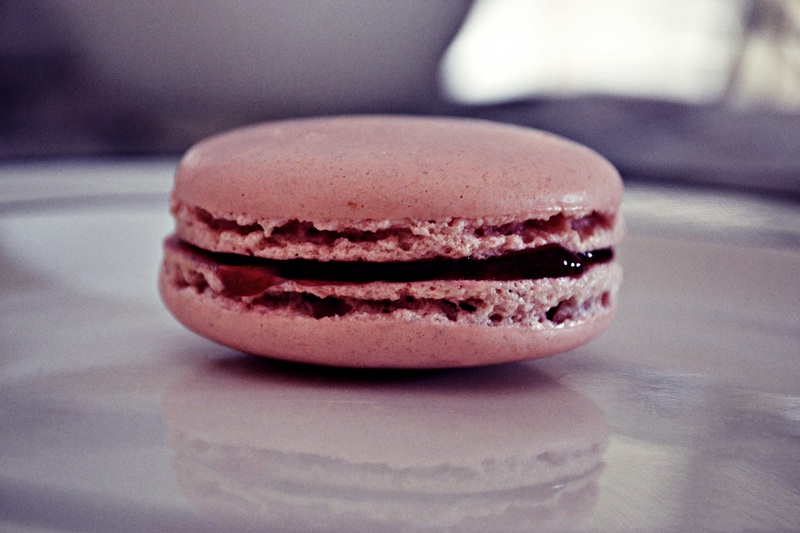 If you stop too early, the macarons will have an irregular surface and may even tear during baking. 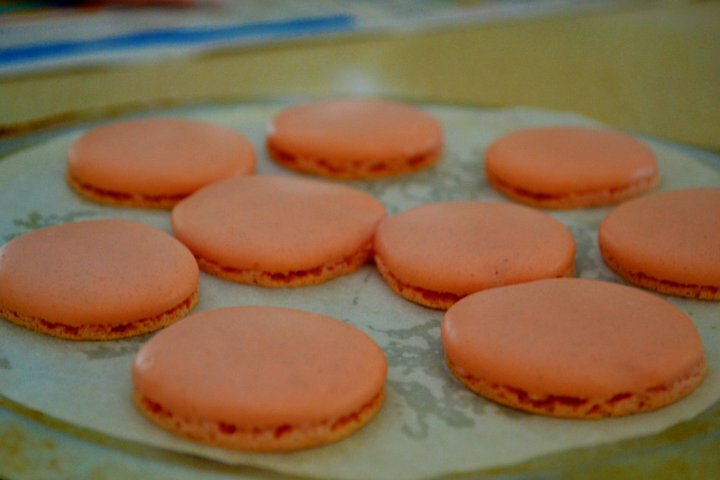 You can subscribe to Keikos website to watch the amazing macarons videos made personally by Chef Keiko. 5. Fill your pastry bag with the batter and pipe out the macaron shells onto a silicon baking sheet (6 mm = ¼ inch pastry tube, macaron diameter 2.5-3.0 cm = 1 inch). I recommend using a silicon baking sheet. If you don’t have one, use a non-stick baking paper, instead. Put the shells aside and let them dry at room temperature. The shells are ready for baking, when the surface no longer sticks to the finger when touched. You can speed up this process by using a hair dryer if you don’t want to wait so long or if you live in a country with very humid air. 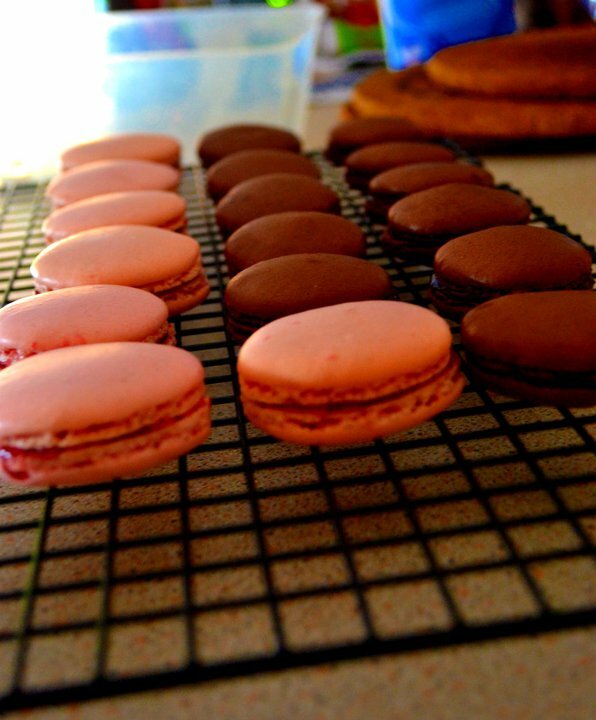 If you don’t wait long enough and no skin has formed, the macarons will tear during baking. Another reason for this kind of “defect” is that the bottom temperature in the oven is too high (compared to the upper temperature). 6. 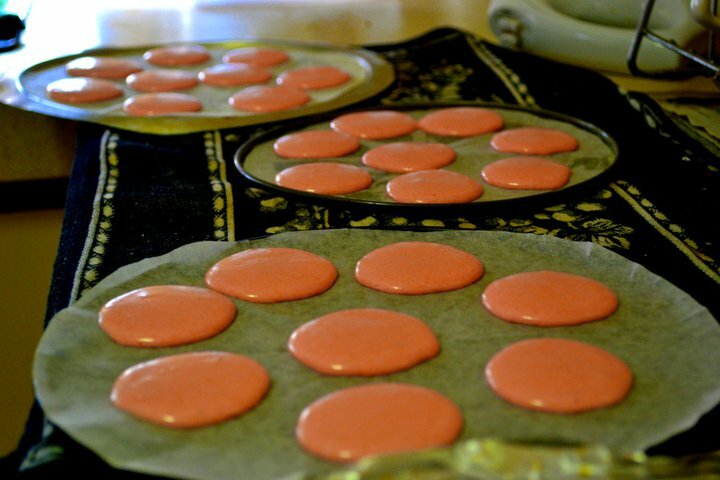 Bake the macaron shells in the pre-heated oven for 13-15 minutes at 160°C (320°F). 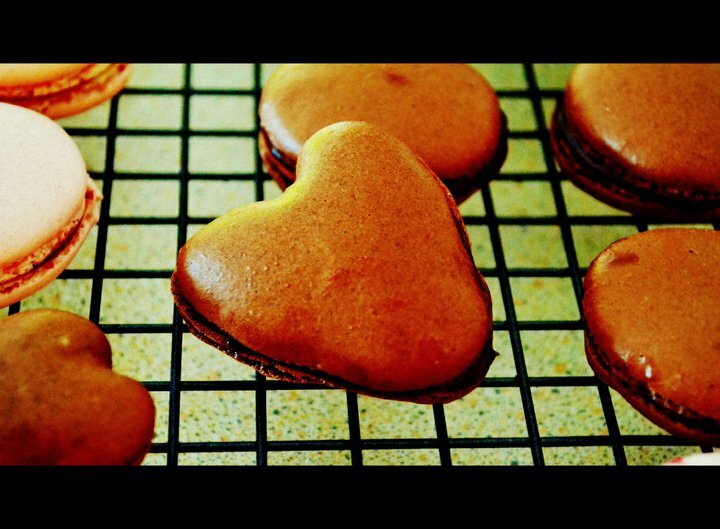 Let the macarons cool down and use a spatula to carefully remove them from the baking sheet. Sort the macaron shells into pairs of similar size. NOTE: To make the pink macaron shells, mix food coloring into the meringue, i.e. before adding the dry ingredients, until you get the desired color. 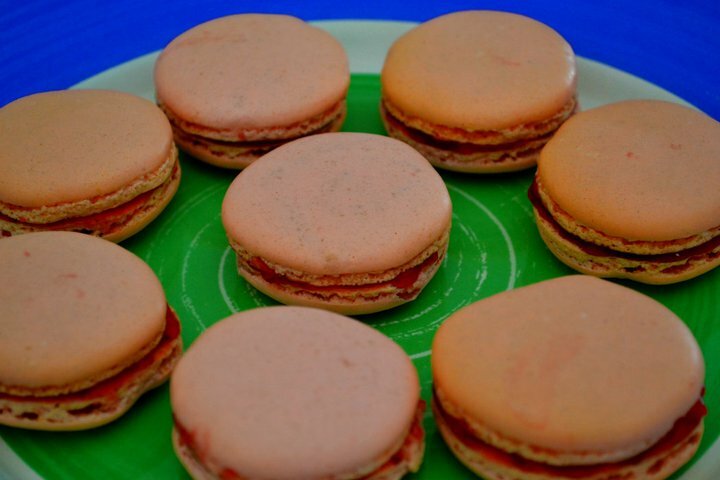 Spread your favorite raspberry jam on one macaron shell and sandwich with another shell of similar size. 1. Bring the heavy cream to a boil, then gently stir it into the chopped chocolate. 2. Stir until the chocolate is fully melted. Next, add the butter to the chocolate and mix until fully incorporated. 3. Put the ganache aside for cooling. 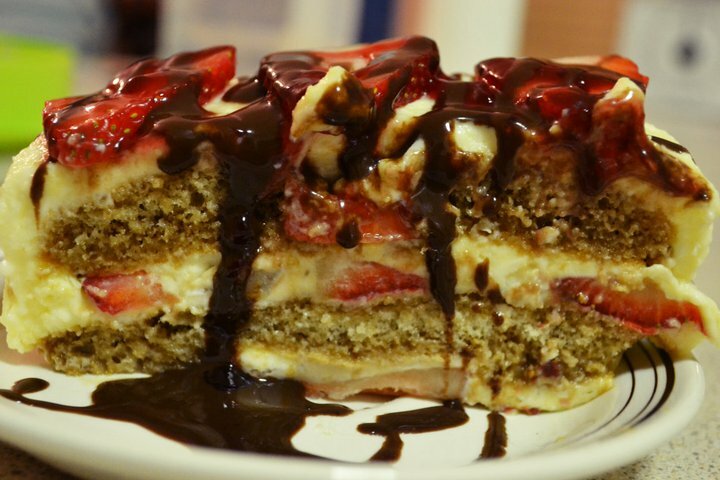 It was one evening after finishing class when I wanted to make this dessert. I have bought all the ingredients that I required on the weekend when me and my housemates went out for groceries shopping. 1. Heat water, sugar, gelatin until dissolved. 2. Whip cream until 60% whipped. 3. Thaw marscapone cheese until room temperature. 6. Dip ladyfingers in coffee. 7. 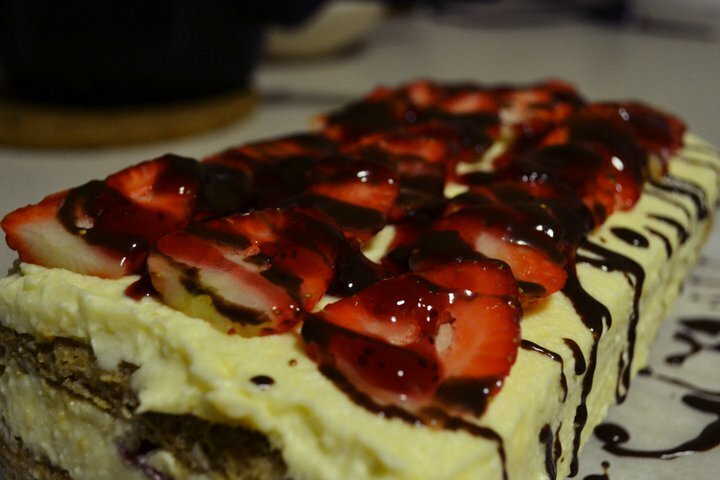 Layer the Berry-Mi-Su with cream, dipped lady fingers, sliced strawberries. Repeat until ingredients are used up. 8. Refrigerate for 3 hours or more until set. 9. 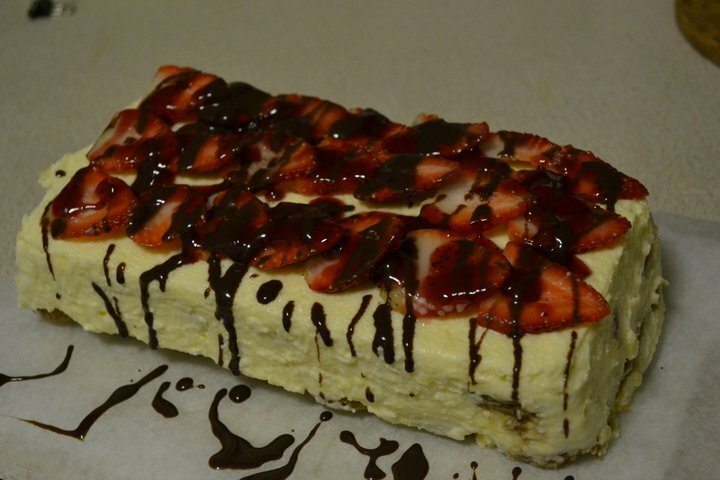 Decorate the top with fresh strawberries, strawberry jam, chocolate syrup, or anything you like. 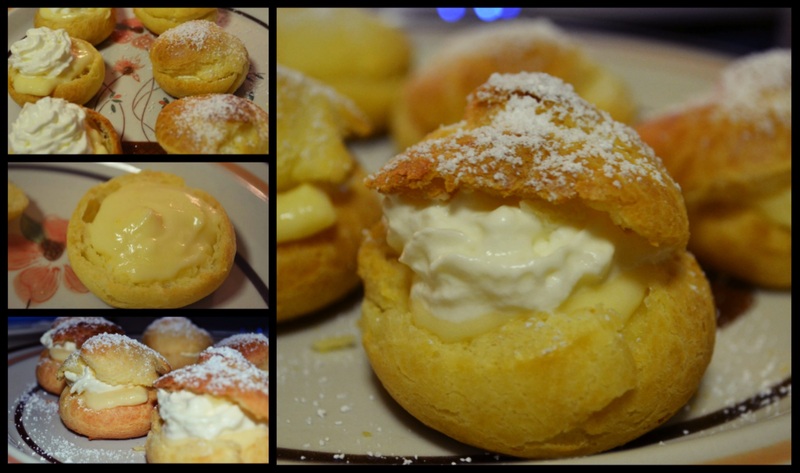 I have made cream puffs so many times before from various sources of recipes but this is a perfect cream puff recipe from chef Keiko. 2. Next, cut the butter into small pieces and put it together with the sugar and the salt into the pot with milk. Bring the mixture to a boil. 3. While the milk is heated and the butter melts, sieve the flour once. 4. When the milk starts to boil and the butter is fully melted, add the sieved flour and stir rapidly. It is important to add all the flour at once. Flour soaks up the liquid quickly and the dough gets lumpy when you try to add more flour later. Keep mixing until the bottom of the pot is covered with a white coating. The paste forms a ball and should easily pull away from the sides of the pan. 5. Put the hot dough into a bowl and add the eggs a little at a time. Keep beating until the liquid of the egg is completely soaked up by the dough before adding more egg. 6. The paste is ready when you have a smooth batter. Tip: If the consistency of the batter is not smooth enough, yet, you can add more egg until it looks like the batter in the picture. 7. Fill the paste into an pastry bag and pipe out round mounds of dough with 4 cm (1 ½ inch) in diameter onto the baking paper. If you have no pastry bag, you can drop the dough from a spoon, instead. 8. Preheat the oven to 200 °C. Bake for 30 minutes. When the puff shells turn brown, lower the heat to 170 °C and continue baking for another 20 Minutes. NEVER open the oven during baking. If you open the oven, the puff shells will fall down and you can start over again. 9. A perfect puff shell should looks brown and crunchy on the outside. Soft and hollow on the inside. 1. Mix the egg yolk and 3/4 of the sugar in a pan until perfectly smooth. Add the flour and mix again. 2. Add 1/4 of the sugar together with the butter to the milk and bring it to a boil. 3. Pour half of the hot milk into the bowl with the egg / sugar. 4. Stir and then return the mixture back into the pot. Keep heating and stirring until the mixture comes to a boil and thickens. Remove from heat. You’re finished when you spot big bubbles of air in the custard cream. 4. Finally, add vanilla essence. 5. 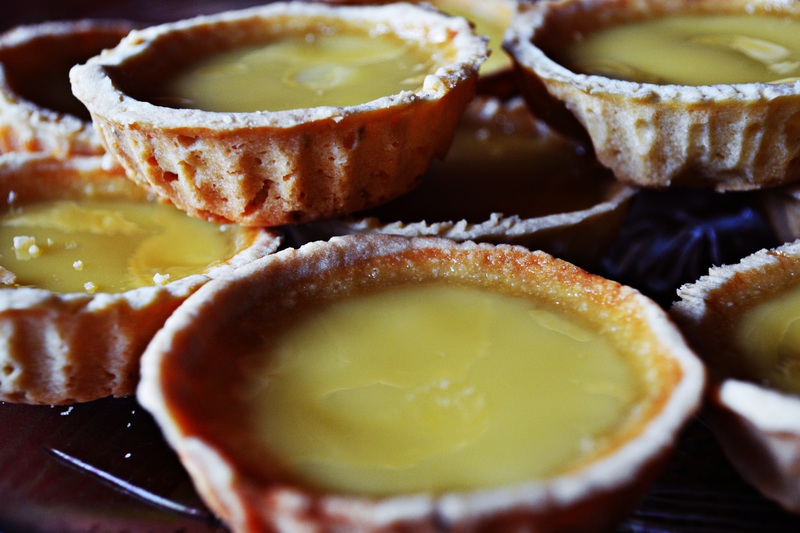 Pour the hot pastry cream onto a baking pan or another shallow pan, so it cools down quickly. 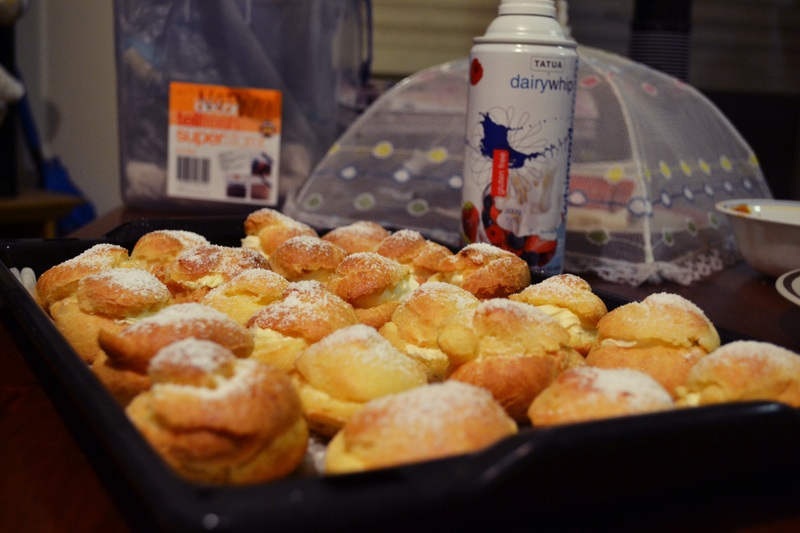 Before using the pastry cream as filling, whip until it is smooth again. 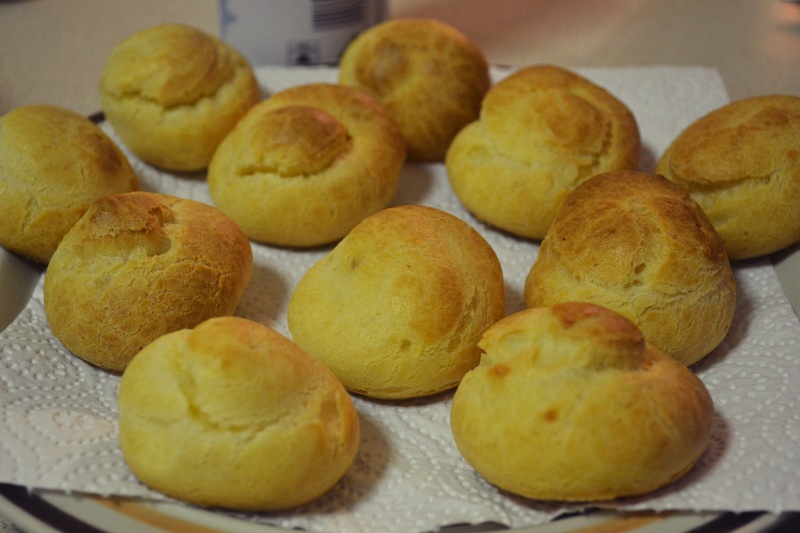 Cut the top 1/3 of each puff shell and fill it with pastry cream. On top of that, add some whipped heavy cream. 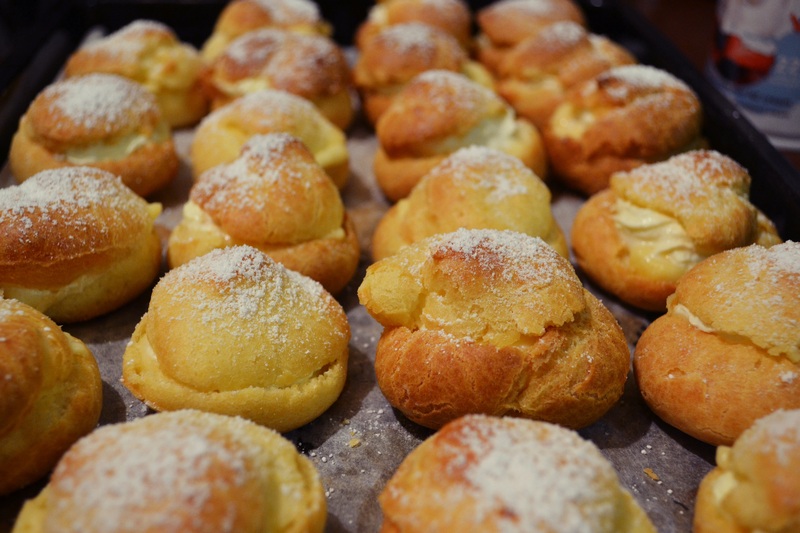 Put the top of the puff shell back and powder with icing sugar.